The Infinite Monkey theorem states that given an infinite amount of time, a group of monkeys randomly banging away at typewriters will eventually produce the entire works of William Shakespeare. The corollary to that theorem states that it will only take those same monkeys 30 minutes to reproduce an article by David Sirota. 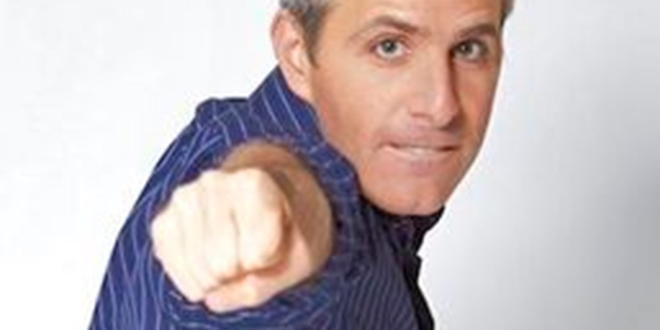 It appears that David Sirota has hit upon the magic bullet to reverse Climate Change – Stop eating meat. First off, David is really worried about CO2 levels in the atmosphere and he paints a pretty bleak picture of our future. Emergency, unsolvable mess, way above what our current ecosystem can handle….Scary stuff. Unfortunately David’s article is wrong on two levels – We aren’t in an emergency and the study he cites is not science. Let’s take a look at a couple of graphs showing what our unsolvable mess looks like (these graphs come from a previous blog post). 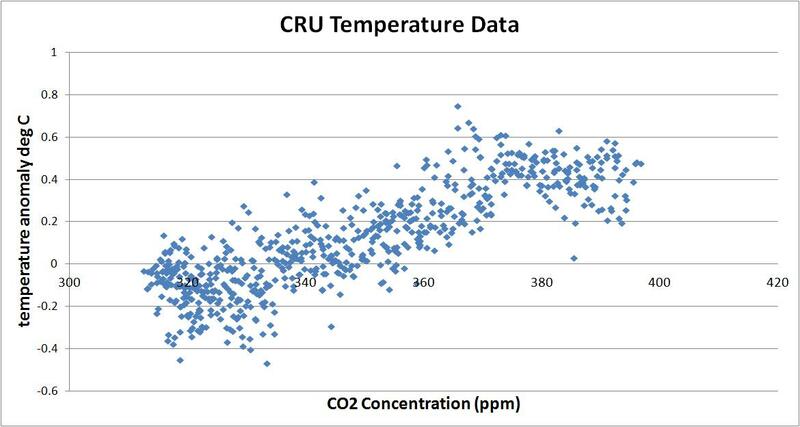 No warming in 15 years and once CO2 levels reached around 375ppm the correlation with warming stopped. Call me crazy but I don’t think we have a problem, emergency, mess or anything else our current ecosystem can’t handle. As is the case with most AGW cult members, David is proposing solutions in search of a problem. Now let’s get to the study that David cites in his article. David uses the word ‘data’ but the numbers published in the study (and since David didn’t link to it, I will here) is not ‘data’ that is measured. 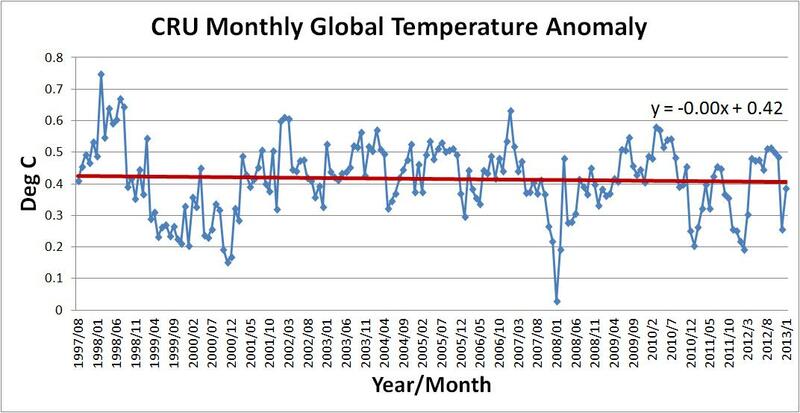 The numbers cited in the study are estimated – sort of like outputs from the climate models of the AGW cult. That is not hard data that you make decisions. The numbers in the study are hypothetical numbers and the study doesn’t describe how these numbers came into being. But apparently that is how David likes to do science. The study makes the claim that 51% of annual CO2 pumped into the atmosphere comes from our animal livestock population. You read that right. We’ve been wasting our time looking at fuel efficient cars, power plants and renewable energy sources. Just stop eating meat (it’s a pure coincidence that David is a vegetarian). This isn’t the first time this idea has been put forth and the theory bases its estimates on the fact that if we weren’t transporting all this livestock around the world or the livestock weren’t eating all the grasslands, breathing and farting then our CO2 levels would decrease. I guess we wouldn’t have to transport vegetables on trucks and they’d be magically teleported to grocery stores but I’m not going to waste too much time going through the study with a fine tooth comb. Like I said, this has been proposed before and the actual math was performed to see what decrease in CO2 levels it would have if we went from a high meat diet to a low meat diet. The results can be found here and it amounted to 12 ppm of CO2. That’s right, just 12 ppm out of a current atmospheric level of 400 ppm would be reduced if everyone in the world took this low meat diet approach. I guess I shouldn’t be too surprised by this science amateur hour from David, he’s not exactly known as an intellectual heavy weight (even though his old Twitter profile picture was pretty scary). Here’s a great video that shows David ‘debating’ in the general manner which most Leftists try to get their points across – screaming, cursing and acting like a 2 year old. Remember that David was also the guy that was hoping the Boston Marathon Bomber would be a white American. He was mocked pretty well for that one. David is your typical whiny Leftist who has nothing to bring to the table when facts are presented to refute their memes. He’s fun to mock but like most Leftists, he should not be taken seriously. Cosmo….LOVE the line: “proposing solutions in search of a problem.” If that doesn’t nail the diatribes of 99.9% (purely made up statistic, but just following David Sirota’s lead) of the whining and sniveling from the Left, I don’t know what does! BUT….since we’re searching for solutions here, may I offer a proposal? Since the Left is primarily made up of feces-filled gas bags, perhaps THEY, and the toxic gas that comes from every orifice they own, IS the problem. As such, we can stop AGW by ENDING Liberalism. Well, I’m all for Leftists remaining silent if that will help the environment! The idea of getting people to just eat less meat is as likely as getting them to take trains instead of cars. It hasn’t been working for six decades. Their best hope is still indoctrination through the academy. In spite of the facts, the indoctrination through the AGW cult will continue. We just have to outlast them long enough and the truth will come out. This guy is an idiot. It has been well documented that the world’s temperatures have cyclically risen and fallen throughout its history, long before man ever set foot on the planet and particularly as the land mass called the Pangea split into continents and is now being documented as shifting back. So long as the earth’s core is active and it is remodeling itself through volcanoes and the shifting of continental plates in the form of earthquakes,, the earth will continue on as a living, breathing, self-determining entity that man will never possess the intellect or power to control other than in the minds of megalomaniacs who can’t accept the truth. Thanks for a very good and entertaining post. That is a great link from Scotese. Thanks for adding to the convo Rick! I know, right? He seemed to take it in stride and be a good sport though.